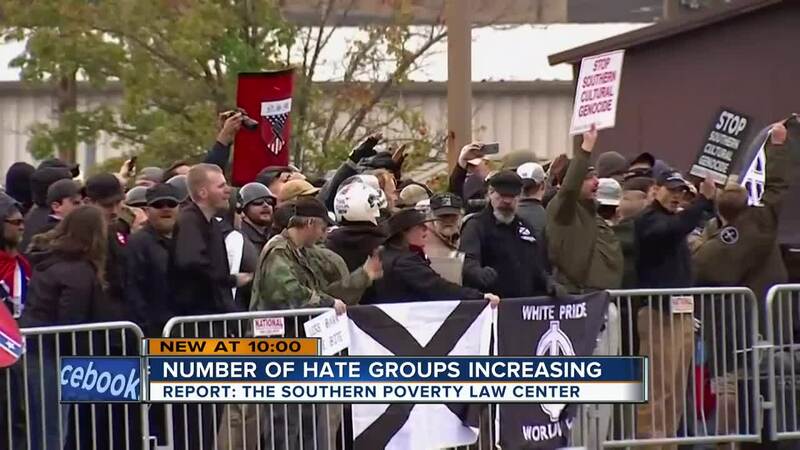 Startling data shows hate groups are on the rise across the country, according to the Southern Poverty Law Center . In Wisconsin, there are 15 active hate groups. More than half are neo-Nazi or white nationalist groups. "The threats are rising. The tone of them is much more hateful. People should be concerned," Ann Jacobs, the Jewish Community Relations Council chair, said. Hateful images and words have been increasing in the area according to the JCRC. The council tracks all threats made against Jewish people in Wisconsin. Next week, the council will release it's latest report. Jacobs said threats against the Jewish community are up 25-percent. "We saw a huge rise in direct threats and harassment of individuals for their Jewish identity. That is just on the cusp of where people then become violent," Jacobs said. The hate groups in Wisconsin are not limited to neo-Nazi and white nationalist. Southern Poverty Law Center also found anti-Muslim groups, black nationalist groups, anti-LGBT and general hate groups currently operating in the state. Jacobs said the problem with any hate group is the hate spreads. "White supremacist groups may say they are only about hating the Jews but it's really about everybody," Jacobs said. Jacobs advice? Do not ignore hate if you want it to stop. "One of the best ways to ways to combat hate of any kind, racism, anti-LBGTQ, anti-Muslim sentiment, is call it out when you see it. To say to the person who is expressing those are hateful and I don't want to be apart of those views," Jacobs said.